Earlier this month, a smartphone labelled as Mi A2 Lite had received approval from Singapore’s Communications Authority. Today, the smartphone has been certified by Eurasian Economic Commission (EEC). Moreover, three new phones such as Redmi 6X, Redmi 6S and Mi 8 Pro have been approved by the same agency along with several other Xiaomi phones. As it can be seen in the listing, the EEC body has approved Xiaomi phones that have been already launched in China. These include Mi 8, Mi 8 Explorer Edition, Mi 8 SE, Redmi 6, Redmi 6 Pro and Redmi 6A. This indicates that these smartphones will be heading to the European market in the near future. Xiaomi phones such as Mi A2 Lite, Mi 8 Pro, Redmi 6S and Redmi 6X that are yet to go official have also received approval from EEC. The certification of Mi A2 Lite by Singapore’s Communications Authority had revealed that it has a model number of M1805D1SG. However, there is no information available on the specs of the Mi A2 Lite. The Mi 8 Pro could be the highest storage variant of the Mi 8 that features the 256 GB of internal storage. Also, there is no information available on the specs of the Redmi 6X and 6S. Since they do not appear like variants of the Redmi 6 Pro, they may not feature notched display. 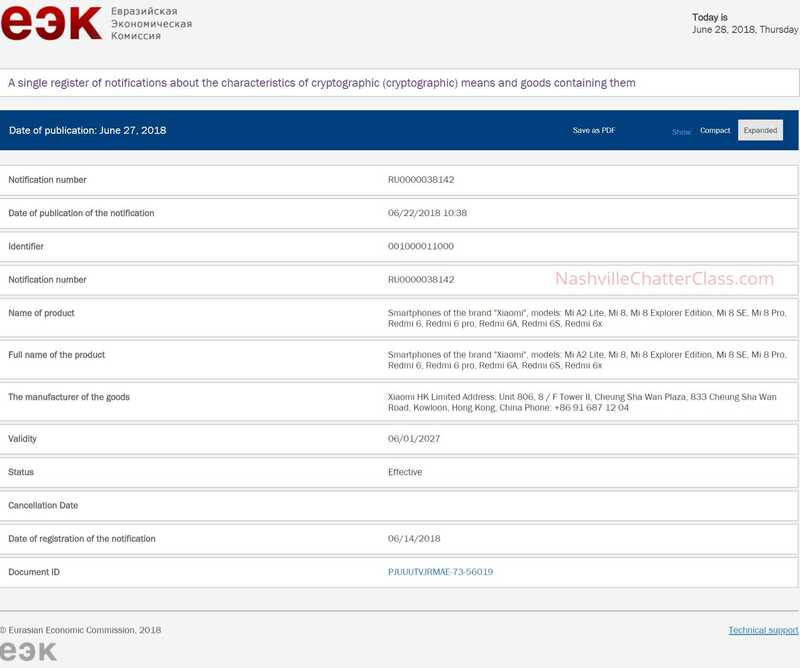 In May, EEC certificate was issued to several Xiaomi devices such as Mi 7 Lite, Mi Mix 2s, Mi Mix 3S, Mi S1, Mi S2, Mi S3, Redmi S1, Redmi S3, Redmi A1, Redmi A2, Redmi Note 6, Redmi Note 6A, Redmi Note 6A Prime, Redmi Note 6 prime, Redmi 6 Plus, and Redmi 6A Plus. The recent EEC listings suggest that the Chinese manufacturer could be prepping up to storm the European market with wide range of smartphones in different price ranges.